I want to tell you about an interesting evolution of the activity of the salmon , which I had seen in a week on the river Chavan'ga in early October this year. I have already said that this season has been one of the driest in the last 10 years. Repeated, though not to the same extent , the drought of 2011. Rain, which could affect the level of water in rivers, was not the end of May . Marshes, which are densely covered tundra were dry. The water level in the lakes , buyout located in the upper reaches of many rivers , have also lost much of its water and became shallow . This led to a marked reduction of water in rivers. Since the beginning of August, the water in the river Chavan'ga became absolutely clear and colorless . It is unusual for the rivers of the region , which usually carry a humus- colored water from the marshes . In Chavan'ga water levels stabilized by mid-August and a further fall in the level was minimal. But the level was clearly inadequate for the active approach of salmon from the sea. In the 2012 season fresh fish in large quantities came into the river from the middle of August. In the 2013 season, the first fresh salmon entered the river until the middle of September. On Varzuga or Strelna situation was quite difficult , as the fresh salmon almost stops at the shallowed estuarine sections of the river . The situation in the Chavan'ga was not as critical. There are plenty of good areas from the first kilometers of the river, good stay and to rest. By the end of September, fresh salmon showed fairly good activity. But the situation is changing right before our eyes. Within two weeks (end of September and beginning of October) it was possible to distinguish three standard variants of behavior and tactics of its salmon fishing. 1. The water in the river is low and very clean. The water temperature of about 8 - 7 degrees. Silver salmon coming up the river quickly , stopping for a short rest in the deepest places in areas with fast-flowing among large rocks and boulders. In large pits on the river bed and on reaches , he appeared less frequently. Most fish were caught in areas with pronounced the mainstream of the river. Such places are easily determined for some experience. Sometimes their width was only 2-3 meters and a length of up to 10-30 meters. But the study of such a place can immediately determine that this ditch carries the majority of the water , there is a foot more dipper and is hiding among the large stones. This is very important for the salmon in a low and clear water situation. 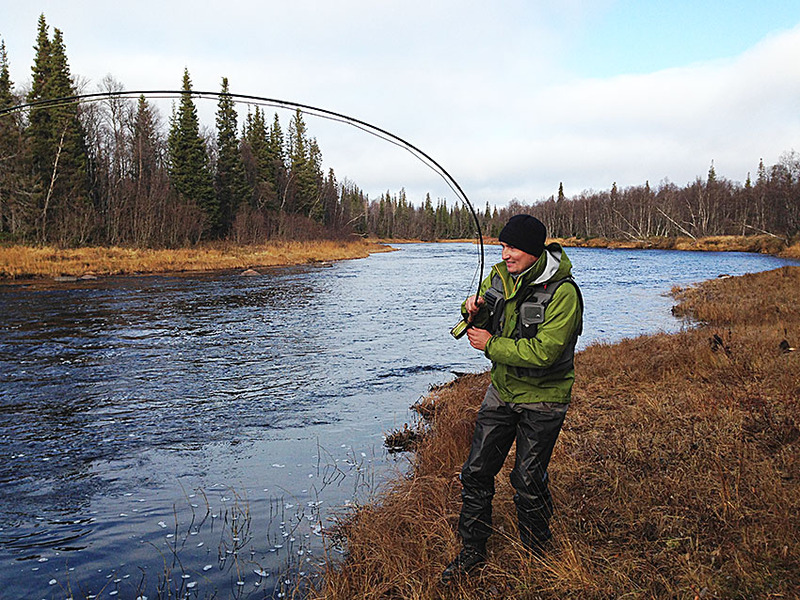 On sites with a good flow and depth , but with a flat bottom salmon almost didn`t got caught . In such circumstances , when there is practically no space to maneuver the fish was very important to accurately apply the fly with minimal lateral drift. Most successful was the reception with a stop flies over the parking lot of fish. Easy to strip also sometimes resulted in biting . At this time the flies were still working medium and small sizes not weighted with a standard combination of colors - black, silver , red and orange. Apply two-handed rods have been difficult . Cast distance decreased to 10.8 meters. we needed a precise cast and accurate understanding of where the fly is . Part of bites accompanied by bursts of water or other obvious signs of activity. Salmon actively responded to the flies presentation and rises up to the surface actively. With a sufficiently large number of bites it can be concluded that it was preferable to use thin nylon and fluorocarbon . In a very clear and shallow water coarse nylon was clearly visible in the sunlight . If we miss the mark with the localization of fish or with the presentation of flies, then we show the elements of our gear, or even line to the salmon eyes. Then a chance to bite sharply reduced. In this case, it was correct to change the place of fishing, go to another pool and return to the same place after an hour and a half. Chavanga nice river in every condition ! A! Fabrizio! You are right as everytime. Thanks a lot! Welcome! !